Our comprehensive service desk offerings include desktop OS support, office applications support, client VPN and network support, virus/malware/spyware support, desktop patch and security upgrades, active directory – account maintenance, and MS exchange – account maintenance. We bring in more than 500 person years of experience in service desk, enabling flexible and scalable engagement models in line with clients’ business needs. Salient features of our services include a shared services model, automation, ITIL based processes, and customized implementation of tools. By leveraging an ITIL-based support framework, we help identify and mitigate commonly recurring problems, resulting in enhanced metric. We apply the right services to meet your specific needs to make it possible to deliver a compute and communications experience that’s personalized for each and every employee, at scale. 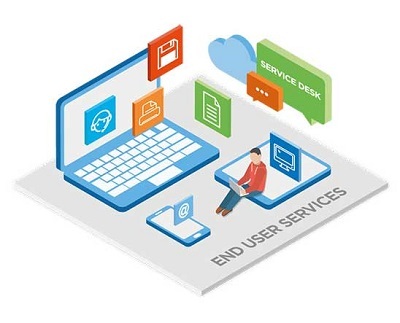 As part of our end user computing services, we help to transform your end-user computing landscape from the current state to a most optimized state and ensure you achieve enhanced end-user productivity and save on costs.